Our S54 Water temperature manifold allows for a simple and effective method of monitoring water temp at the cylinder head, where temperature samples are most accurate. 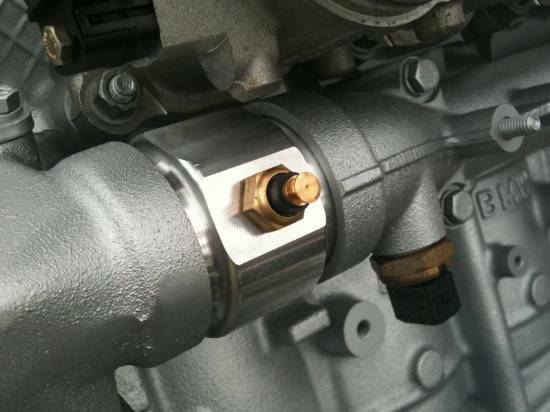 Installs with use of the factory O-ring. This manifold has two beveled flat surfaces on its side to facilitate the installation of whatever sensor type your water temperature gauge, or data logging uses. We have already pre-drilled and tapped a 1/8th NPT with an included plug for the most common sensor type. There is plenty of room for most sensors so you can also tap the second flat area for whatever thread pitch you may need. Water temp is critical to monitor while racing, or in any performance vehicle. This simple but effective part makes installing sensors a snap, with no permanent modifications to damage or leak. Includes 1/8th NPT port pre-tapped. A second flat is blank, so any sensor thread pattern required can be tapped Great for the track car or S54 swapped vehicle. Please note: Temperature sensor shown installed for example only, not included.